A pupil of the Cervelli and Mazzoni, he came into contact with the painting of the Giordano in Venice. He stayed in Bologna, Parma and Rome, where he saw the works of Carracci, Pietro da Cortona and Baciccia. In 1695 he went to Milan to fresco the dome of S. Bernardino dei Monti, in which elements of the Baroque figurative culture and Caravaggesque and Corrigogian styles emerge. Starting from 1708 his style was decidedly oriented towards the Rococò movement and he thus became one of the most significant innovators of 18th-century Venetian painting together with Tiepolo. 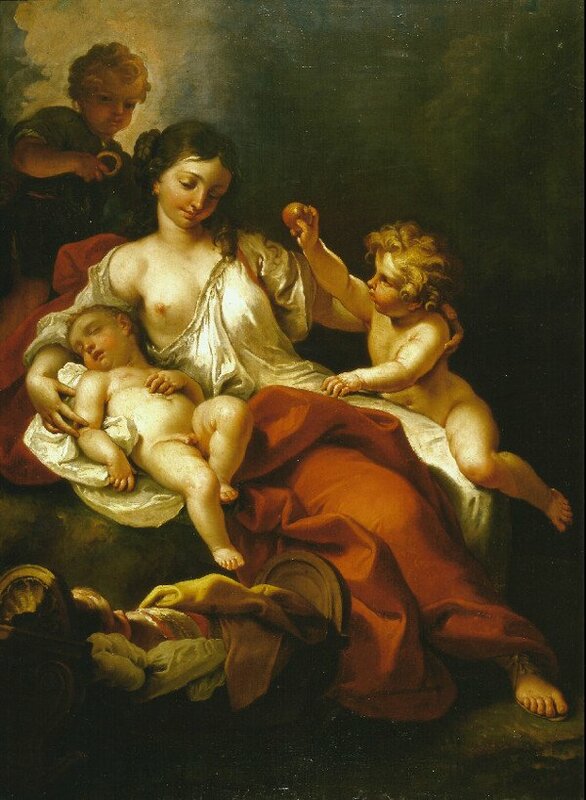 A young mother is surrounded by her four children in a scene that can be defined as "Motherly Love". Although it is probably a youth work (about 1700), there is something of the Rococò spirit, which anticipates Fragonard, who treated the theme equally. The main figure wears a reddish-brown cloak over a white robe, and the same red pigment is used for the bandages wrapping the baby in the cradle. The sky is mostly a dark blue grey except for a lighter light at the top of the painting. In that area we also find repentance around the child's head. The child with the apple appears as an angel in the Ascension in the Church SS. Apostles, documented since 1701. "L'Opera complete di Sebastiano Ricci" Classici dell'arte Rizzoli. Introdotta e coordinata da Jeffrey Daniels. Rizzoli editore.